Delegate Rob Bell (R-Albemarle/Greene/Orange) acted as master of ceremonies for the event. In this video segment, he begins by pointing out local dignitaries in the audience, calls on people to lead the group in prayer and in the Pledge of Allegiance, and calls upon Albemarle County Republican Committee chairman Christian Schoenewald to introduce the featured speaker. 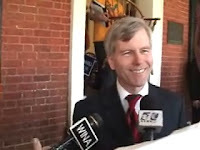 Former Attorney General Bob McDonnell then takes to the lectern to give a version of is campaign kick-off tour stump speech. His remarks took about 20 minutes, so I have divided them into two parts. A cliche-fest. If a novel idea has attended, he would be the loneliest concept in the room.